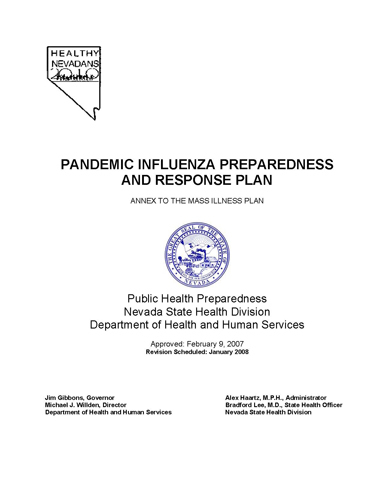 This Pandemic Influenza Preparedness and Response Plan is a guide on how to prepare, detect, and respond to an influenza pandemic in the state of Nevada. This plan is written in accordance with guidelines set forth by the Centers for Disease Control and Prevention (CDC) and describes the emergency management concepts and structure under which the Nevada State Health Division (NSHD) may operate. The plan outlines the roles and strategies of NSHD in coordinating the public health response to a pandemic with local health authorities, the healthcare community, the federal government, and other key partners. Consistent with NSHD’s mission “to promote, preserve and protect the health of all Nevadans and visitors to the state through its leadership in public health and enforcement of laws and regulations pertaining to public health,” this plan provides a framework for NSHD pandemic influenza preparedness and response activities. The goal of these activities is to reduce the morbidity, mortality, and social and economic disruption caused by pandemic influenza. The plan is an annex to the NSHD Comprehensive Emergency Management Plan (CEMP) and is consistent with the U.S. Department of Health and Human Services Pandemic Influenza Plan, November 2005. The Pandemic Influenza Response Plan should be shared, read, and understood prior to an influenza pandemic by those individuals within the NSHD, as well as its public health partners, who may be involved in the response to such an event. • While this plan serves as a guide for specific influenza intervention activities, during apandemic the judgment of public health leadership, based on knowledge of the specific virus, may alter the strategies that have been outlined. o Imposing other community containment measures as required. • The State Health Officer, NSHD Administrator, or Deputy Administrator may activate the PHCC and deploy NSHD personnel for pandemic influenza response (See the PHCC SOP for the PHCC Call-Down Roster). • DEM has its own protocols and authority to activate the SEOC. If activated at this point in the pandemic, the Emergency Support Function (ESF) 8 liaison may be requested at the SEOC and would be responsible for assisting in the coordination of public health, and medical services/resources. While serving at the SEOC the ESF 8 Liaison may accept requests from other ESFs. The PHCC assists the ESF 8 Liaison to process requests and it is not uncommon to have other ESF Liaisons serving at the PHCC to assist in the coordination of response efforts throughout the pandemic. • NSHD staff at the PHCC will document response actions taken throughout the course of the pandemic event. • NSHD may coordinate the deployment and staffing of Disaster Medical Facilities (DMF) if required. If local hospitals reach surge capacity, the DMF may be used for triage of patients for isolation and quarantine, as well as for setting up mass vaccination clinics. The NSHD maintains the Nevada Hospital Association (NHA) Disaster Medical Facility Field Manual for this purpose. at the SEOC, the PHCC and the American Red Cross to provide mass care, housing andother human services as they become necessary. The NSHD through the PHCC and the SEOC may assist in coordinating staffing services for these shelters, as needed. The location of these shelters may be situation dependent. The NSHD Mass Illness Plan outlines measures that can be taken to address and reach populations with special needs. • In the event that the number of fatalities exceeds the capacities of state resources, the NSHD may ask for the SEOC to request a federally provided Disaster Mortuary Operational Team (DMORT) which will provide additional supplies, equipment and staff. • As the need for coordination decreases the Public Health Coordinating Officer may evaluate the activation level of the PHCC and may determine whether or not to begin deactivation, cognizant that a second pandemic wave may or may not follow. Pandemic influenza is a unique public health emergency and community disaster. It is considered a highly probable, if not inevitable event, but no one can predict when it will occur. There may be little warning, but most experts agree that there may be one to six months between identification of a novel virus and widespread outbreak in the U.S. Outbreaks may occur simultaneously throughout the U.S., and the effect on individual communities may last from six to eight weeks or more. Pandemic influenza has the potential of affecting all elements of society. A large number of cases may add burden to hospitals and other health care systems already stressed with the normal day-to-day crisis. Mortality may be markedly increased. Health and medical personnel as well as other infrastructure workers, i.e. law enforcement, fire and public works, will not be immune. The effects on communities could be staggering. A health authority may take a person or group of persons alleged to and reasonably believed by the health authority to have been infected with or exposed to a communicable disease into custody in any safe location under emergency isolation or quarantine for testing, examination, observation and the provision of or arrangement for the provision of consensual medical treatment; and to transport the person or group of persons alleged to and reasonably believed by the health authority to have been infected with or exposed to a communicable disease to a public or private medical facility, a residence or other safe location for that purpose, or arrange for the person or group of persons to be transported for that purpose by a local law enforcement agency; a system for the non-emergency medical transportation of persons whose operation is authorized by the Transportation Services Authority or an ambulance services that holds a permit issued pursuant to the provisions of Chapter 450B of NRS.